Watch last year's 2015 cult film 'The Lobster' and you will forever be reminded of this haunting dip in the world of twisted love. Lobsters live for over 100 years, are blue blooded like aristocrats and stay fertile for all of their lives. 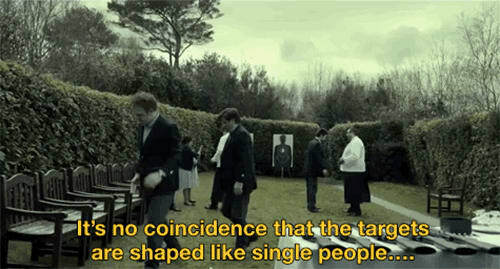 Watch last year's 2015 cult film The Lobster and you will forever be reminded of this haunting dip in the world of twisted love. A reality where romance is done via sign-language, dogs are kicked to death and you are likely to choke to death on an olive whilst being scarred by a toaster for masturbating. An up to date black comedy of The Island of Dr Moreau, your future as a human is threatened in favour of a life as an animal. You must take your pick on what you want to be, but pick carefully. The fifth film from Greek director Yorgos Lanthimos, The Lobster represents his English language debut; starring (a slightly portly) Colin Farrel as the sombre inhabitant of room 101. This is in no doubt reference to room 101 in the George Orwell novel 1984. Alongside his brother (a dog called Bob) he sets up residence in an eerie Fawlty Towers-esque building, simply called 'The Hotel'. Farrell plays the only named character (David), surrounded by an ensemble of characters such as Biscuit Woman, The Lisping Man and Heartless Woman. In a similar vein of Layer Cake, their names remain a mystery, but not as a stopping point of the film. In a world where two is definitely better than one, single people are forced to live their lives literally hunting for a mate. Couples populate 'The City' whilst singletons are shipped to 'The Hotel'; the premise: you have 45 days to attract a mate, fail to do so and you will be forever turned into an animal. Successful couples spend two weeks on 'The Yacht' to iron out any marital strife before eventually being amalgamated back into society. Those with bigger problems are assigned a child, this film's answer to fixing a problem. A social commentary on the state of marriage in the 21st Century. A wolf and a penguin could never live together, nor could a camel and a hippopotamus. You can extend your stay by hunting 'loners', guests who have escaped the confines of 'The Hotel' and live a free life. Things appear to be no better for the 'loners' when we are introduced to the rag tag group during the final act. Lead by Spectre's Léa Seydoux it is apparent life at 'The Hotel' isn't as bad as David first thought. The grey Dublin backdrop and constant rain emphasise the bleak irony of The Lobster. There is blood and biscuits everywhere, I hope she dies right away. Methods of the animal operation remain a mystery, but guests postulate on how you have your eyes and vitals removed, before being squashed into the corpse of whichever beast you pick. We never get to see behind the doors of the creepy 'Transformation Room', but can only imagine what Orwellian machinery hides behind it. Also we rarely get to find out what the rest of the guests pick as their animal counterpart, but perhaps (alongside the names) this is all part of the intrigue the film leaves you with. The Lobster ends with you asking more hows and whys than an M.Night Shyamalan epic. Performances are nearly flawless, as each actor plays the socially inept caricatures of modern life. John C. Reilly's The Lisping Man bungles through the two hours like the sad husband he played in Chicago, whilst Olivia Coleman brings her Peep Show quirkiness to the role of Hotel Manager. Ugly Betty's Ashley Jensen is the downtrodden Biscuit Woman who is destined for misery when falling for David, and Ben Whishsaw joins his Spectre cast-mate (Seydoux) as the sinister The Limping Man. However, apart from Farrell, the film is made by Rachel Weisz. Her turn from film narrator to main heroine in the final half pulls her joint with Farrell for screen time. Their Thelma & Louise run asks you "Is love blind?" in a truly chilling way. If you are looking for a happy ending or some light entertainment then tune out; The Lobster has the quirkiness of a Wes Anderson film, but with none of the whimsy. Parallels can be drawn between The Grand Budapest Hotel, including an all-star cast of "Oh it is so-and-so", but arguably the melancholy atmosphere of The Lobster makes it superior. This is one film that will leave a bitter taste in your mouth after watching, and we couldn't be happier. Boil the pot, grab the shellfish and start cracking the claws, The Lobster is a must watch!